Social work educators can play an important part in ensuring that the promotion of health and well-being is firmly on the social work agenda for service users, as well as for students and educators. Nevertheless, this has not been a priority within social work education and presents a challenge which requires some re-thinking in terms of curriculum content, pedagogy, and how social workers respond to social problems. 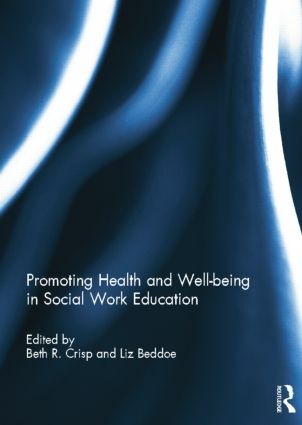 Furthermore, if the promotion of health and well-being is not considered a priority for social workers, this raises important questions about the role and relevance of social work in health, and thus poses challenges to social work education, both now and in the future. This book contains contributions from social work educators from Australia, America, Canada, New Zealand and the UK. They reflect on how best to prepare students to put health and well-being to the forefront of practice, drawing on research on quality of life, subjective well-being, student well-being, community participation and social connectedness, religion and spirituality, mindful practices, trauma and health inequalities. This book is an extended version of a special issue of Social Work Education. Beth R. Crisp is Professor in the School of Health and Social Development at Deakin University, Australia. Her teaching and research interests include addressing poverty and social exclusion, the relationship between religion and spirituality with social work practice, and workforce development. Liz Beddoe is Associate Professor in the School of Counselling, Human Services and Social Work at the University of Auckland, New Zealand. Her teaching and research interests include critical perspectives on social work education, professional supervision, the professionalization project of social work, interprofessional learning and the development of health social work.